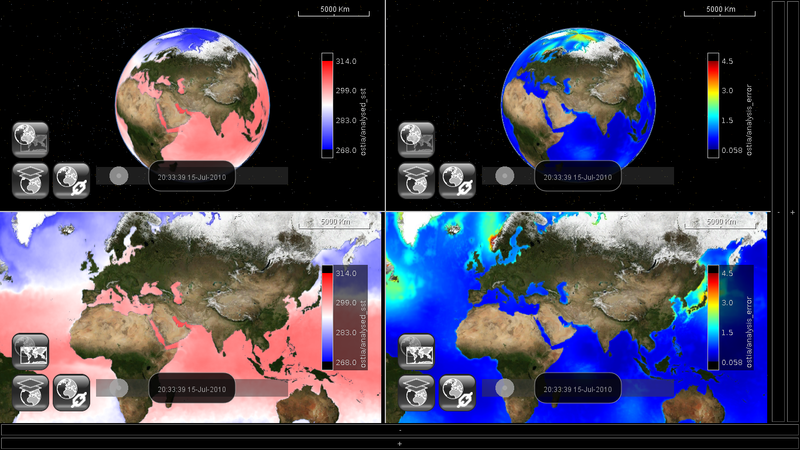 The ReSC has developed open source software for data sharing and visualization. This software is still maintained and available - please follow the links below. ncWMS is an implementation of the Open Geospatial Consortium's Web Map Service protocol for serving map imagery over the Web. It is widely used for interactive web-based visualization of multidimensional data by research institutes, government agencies and industry around the world and is available as a standalone web application or as part of the popular THREDDS Data Server. 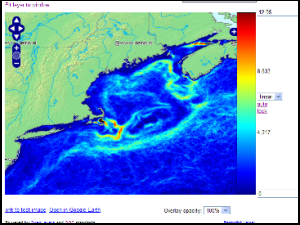 It has been adapted to form the View Service for CMEMS (Copernicus Marine Environment Monitoring Service, formerly MyOcean), which serves ocean data from data providers around Europe. You can find out more and obtain the software from the project website. You can use a demonstration website here: http://godiva.reading.ac.uk/. EDAL (Environmental Data Abstraction Library) is a set of Java libraries to deal with the manipulation and visualisation of environmental data. They were originally created as part of ncWMS but have been factored out into a separate project to enable wider re-use. EDAL consists of a number of modules, each focused on a different task. Please see the project website for more details. To ensure that the maximum potential of the videowall facility is reached, we at ReSC have developed custom software for exploring and comparing 4-dimensional high-resolution datasets. Designed for the video wall, this software is also capable of running perfectly well on a modern desktop machine. This research-focussed software has a number of innovations for visualising and querying the type of large data collections which researchers in the department use on a day-to-day basis. It enables users to view and query multiple datasets simultaneously, and allows them to smoothly and intuitively scan through the time and depth dimensions, creating dynamic animations where in the past pre-rendering would have been required. The code is based on the NASA World Wind SDK as well as our own EDAL libraries developed for ncWMS. To get an idea of the capabilities of the software and see some demonstrations of it in action, have a look at the video below. Excited? Ready to try it out yourself? You can download the application for Windows or Linux here. These packages include the application along with some sample data from NOAA to get you started. Just unpack them, double click the multiglobe.jar file and you're away! For more information on usage, have a look at the user guide included in the package. If you would prefer to download the source code, it is available here. It's all built with Apache Maven and you can run it with mvn exec:java, or build it in the usual Maven way.